It's important to introduce exercise into children's lifestyles at an early age and yoga is perfect for this. Many parents in the UAE are concerned that kids are not getting enough exercise. Even younger children can benefit from adding some extra-curricular exercise to their week. Yoga is perfect for this and introduces even the youngest of kids in the UAE to regular exercise for body and mind. Aileen, a yoga personal trainer in Abu Dhabi who works with children of all ages gives some advice in this Q&A about how Yoga can be of benefit to your kids. Yoga for kids in the UAE is a great introduction to leading a fitter, healthier lifestyle. For parents in the UAE can you provide some examples of how yoga classes for kids help with getting some extra-curricular activity into their routine? Children’s Yoga programmes are a great addition to a child’s extra curricular activities, Classes are specifically designed for children and can be very different in the delivery compared with a class for adults and as they should be. Children’s Yoga classes are full of movement and fun which allows children to get a better understanding of themselves and their bodies in a safe and non competitive environment. Every child is different and this is what Kids Yoga teachers adhere to nurture. Yoga Increases fine motor skills, is non competitive, cultivates happiness & confidence, is fun & safe. Kids leave classes feeling happy and calm. Is there any lower age limit for when children in the UAE can start to participate in yoga for kids classes? 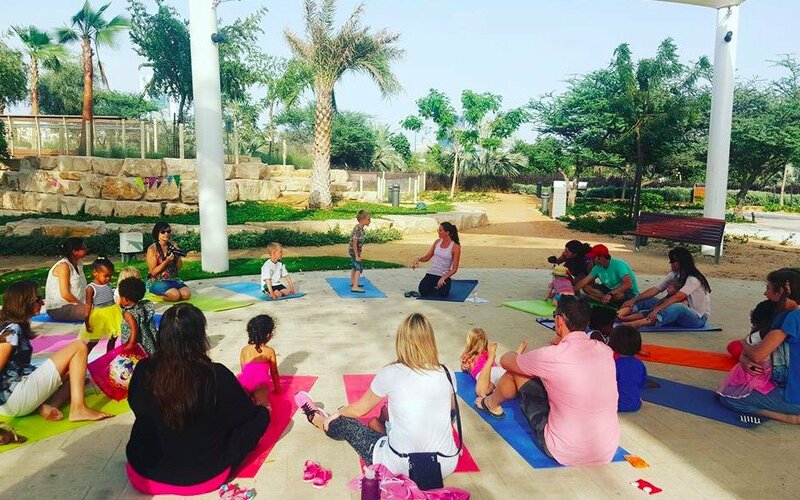 Yoga is literally for everyone including babies in Abu Dhabi where classes are available along with mummies. I teach children at nurseries from around 18 months, classes are full of movement and fun with time for breathing and calm too. Children learn in different ways and i always like to take little ones on a yoga adventure allowing them to experience a variety of movement including balance, strength, breathing and calmness with yoga poses, stories, games & songs. Children will build a foundation for a fit & healthy lifestyle as they learn and grow with 30 minute classes. As children reach 5 and above they are able to take direction and classes are full of laughter and movement with children enjoying the quiet mini meditation times as the weeks go by, you notice children becoming more focused and better listeners. It really is something special to see children being allowed to simply follow there own bodies and trust themselves. Little Yogis are happy and confident children. 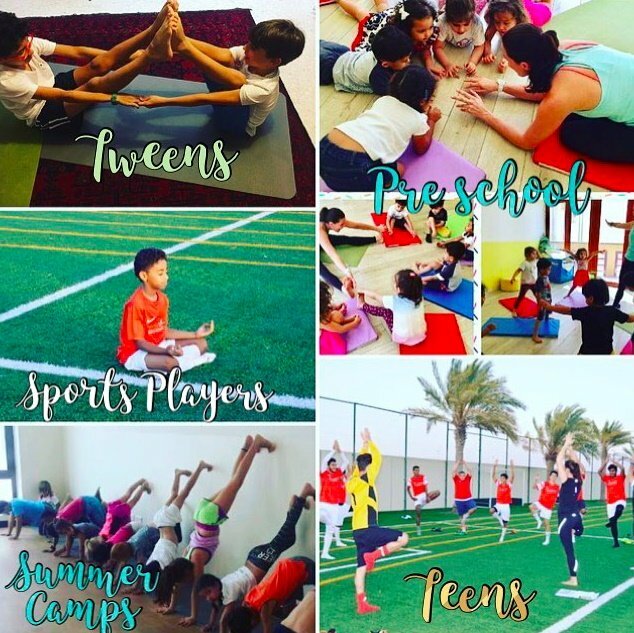 As a professional kids yoga teacher in Abu Dhabi how are your classes organized and what can children expect to learn about yoga and fitness in general? In Abu Dhabi I teach small private groups from age 5 and above this is usually in a space in one of this childrens homes. In nurseries i teach again small groups of 8-10 pre schoolers. I often work at events teaching larger groups from 10 – 50 kids! Children will learn about movement, relaxation, mindfulness, keeping healthy and mainly that yoga makes them feel happy and calm. Are there any yoga poses (asanas) that are suitable for children with little or no yoga experience? Children’s yoga is non competitive, fun and available to every child. The emphasis is more on movement and enjoyment. If i were to pick a pose that kids enjoy i would say Tree Pose is a fun one. Children, especially when in a group, can often get distracted – how do you keep their focus on the class – what fun elements do you use in a yoga class? I usually create stories for younger children in Abu Dhabi and they play parts of animals, shapes, sing songs and use props such as a soft toy on the tummy for breathing exercises which is always a good way to bring down the energy and get kids to have some calm time. For older ones making the yoga class fun usually starting with lots of movement so children are ready to be more relaxed near the end, allowing them to demonstrate to each other or do partner yoga usually gets distracted kids back in the flow. For parents thinking about yoga classes for children in Abu Dhabi or Dubai what are your top 5 tips? Go with a Qualified Children’s Yoga teacher in Abu Dhabi, although a qualified adults Yoga teacher will be able to offer a safe class. Only a qualified kids teacher will know the key elements for a class that allows children to learn and grow without barriers. Don’t be a pushy parent! Children’s Yoga is a time for kids to learn, grow and explore in there own time. If you keep stepping in this takes away the freedom of the child to be themselves. There are no expectations, milestones or grades simply an open place to be themselves. Book your children in for a course to give them time to settle in. If a child really doesn’t want to attend after 3- 4 weeks then maybe they are not ready for extra curricular Yoga yet. I have experienced this with other activities sometimes especially younger ones aren’t ready for a full school day and then another activity and that is normal. Give 6 months and try them again usually works for kids that can’t settle. Ask your children to show and talk about what they have learnt in class this a great way for you to get a fun shared connection with your child, as you can also copy a pose or two. Get your kids started this term! and watch them flourish. Kids Yoga is available in most Yoga studios, Health Clubs and many Schools. Abu Dhabi Female PT Aileen has been working in the Health & Fitness industry as a Personal Trainer & Group Exercise Instructor for over 10 years. She passionately delivers all round wellbeing programes for Children’s and Adults, working with individuals and often their families too. You can view Aileen’s full Abu Dhabi personal trainer profile by clicking the link below.